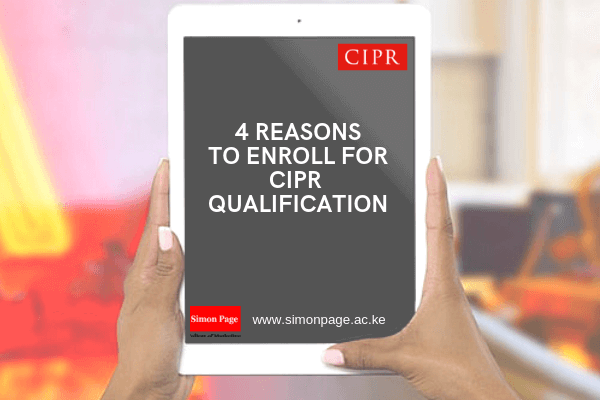 4 reasons to Enroll for CIPR qualification. | Simon Page College of Marketing, Kenya CIPR intake Ongoing. 04 Mar 4 reasons to Enroll for CIPR qualification. If you are reading this, it is because you are interested in Public Relations. Whether you are just trained or a certified Public Relations practitioner, our CIPR courses are strategically designed to cater for your needs. You can either enroll for a CIPR Professional PR Certificate or Diploma depending on your level of expertise. Our CIPR qualifications will help you progress towards a senior management position. The Chartered Institute of Public Relations (CIPR) is the Royal Chartered professional body for public relations practitioners in the UK and overseas. We are excited to announce that Simon Page College of Marketing is now offering CIPR Qualifications. Our CIPR Classes commence on the 6th of April at the Barclays Plaza. Everyone out here is working hard to raise the bar a notch higher with their Professional Profile. You are here because you are seeking ways on how to do that. CIPR is what you’ve been looking for. Becoming a CIPR member will not only enable you to be on the listings of an international PR members’ directory but also prove your accountability at an international level. Maybe the reason you have not received a promotion in past few years is because you have not embraced the new way of running your PR practice. CIPR Qualifications can help you remain at the cutting edge of the industry. By continuously developing your professional skills, you will remain updated on the global PR developments. CIPR membership creates opportunities for you to connect with other PR experts around the world. Gaining a Chartered PR Practitioner status will expand your network and create more business opportunities for you. CIPR Code of Conduct will help you prove your capabilities. It will also show your commitment to the PR profession. Boost your PR professional profile with a CIPR qualification and see the magic!